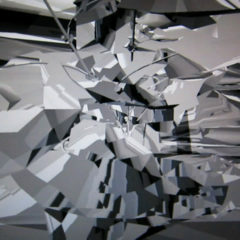 Born in Atessa (1978), Flavio Scutti is a producer of video and sound digital art. He started to be interested in computer graphics as a teenager, when he bought a Commodore Amiga. Since 1995 he's leading researches about new and experimental audio-visual languages, through the study of electronic systems. In 2002 his works have been showcased at MACRO, Museum of Contemporary Art of Rome. In 2004 he graduated in Scenography at the Academy of Fine Arts in Rome. Between 2002-2004 Flavio partecipated to “Pink, Red, Black sweater Project”, with whom released two works, one audio, “Four Tone”, and one video, “Elementare Drive”. In 2006 a track of him has been included in the chiptune music compilation called “BIT BEAT” by to lose la track. Keen on the world of 8bit arts, Flavio Scutti is member of MicRoma and collaborates with other international collectives organizing promotional events. In 2007 he made sounds for the visual performance mammam at Palazzo delle Esposizioni. He founded the synth pop duo band le ROSE. In 2012 was present in a collective video installation curated by Dumb Eyes Creative Director, Christian Petersen at Lawrence Loft in Seattle. In June performed "Neutrini" a sound scapes work on the subnuclear particles at The Format Contemporary Culture Gallery in Milan. "Rides" born shooting a video on the carousel in a local festival, the "Crazy Surf" of Zamperla. For many years I did not live such an experience and during the race resurface many memories that I thought I had lost, but they were there as a liquid dream trying to tell me something about my future, because a dream is self-contained in himself, in 'act of dreaming; both physical and mental, because when you dream, your world is in the dream itself. To bring out the images exists a deterministic mechanism, where numerous steps morphing applied to shrink frame shapes in a stratification that shapes the virtual reality environment. The sounds following in a parallel obsessive, almost hypnotic; permeate the space in a random sequence at each repetition enriches the experience of the reconstruction detail.